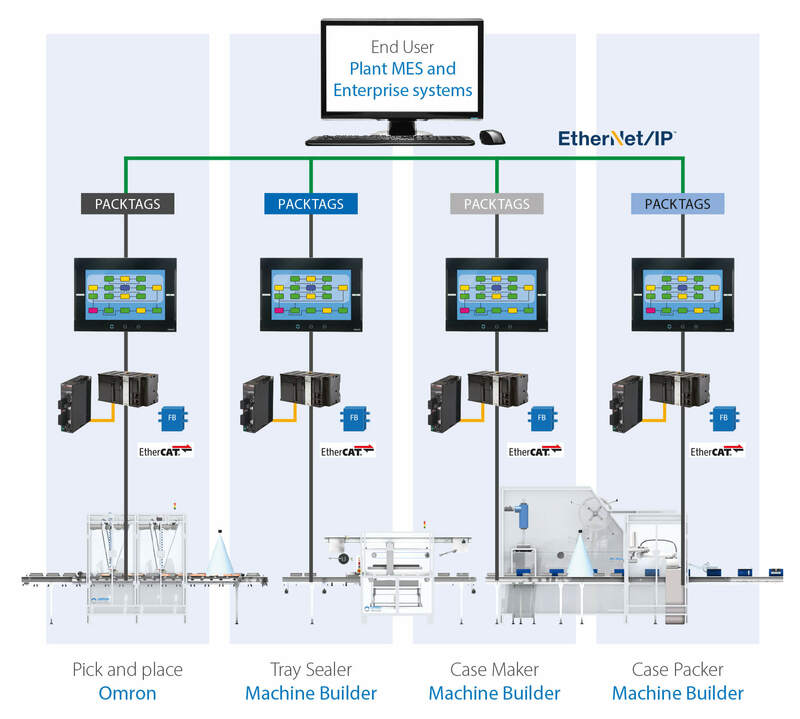 At Omron, we can make it easier to integrate your packaging machine into a production line. With Sysmac Studio PackML, you can ensure your quality standards in machine-to-machine communication, monitoring and maintenance. PackML ensures functional interoperability and a consistent look and feel across the plant floor. The machine state model defines a series of modes and states in the machine interfaces. PackML also has common method of conveying important data about each system through PackTags: these are named data elements used for data exchange in packaging machinery. PackTags describe the condition of a machine in a very specific and standardized format. 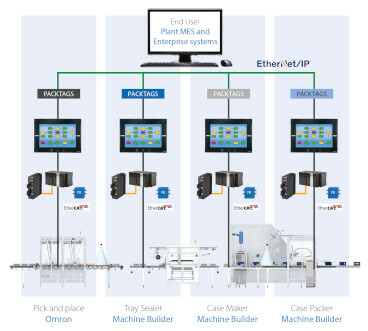 It simplifies machine-to-machine integration but also the communication from the shop floor to the top floor and integration with the Manufacturing Execution System (MES). Makes it easier for machine builders to integrate their machinery into a production line. Allows Systems Integrators and OEMs to use the technologies they know best. Same look and feel for the operator. Same look and feel for the technician. Standard information in/out of any PackML v3.0 capable packaging machine. Robust and modular software programming. PackML simplifies machine-to-machine and line-to-MES integration. 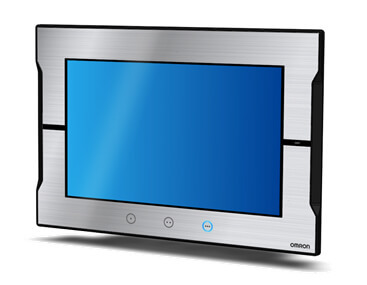 The PackML standard defines a series of modes and states to ensure a common HMI look and feel. It also provides a common method of conveying important data from one machine to another. 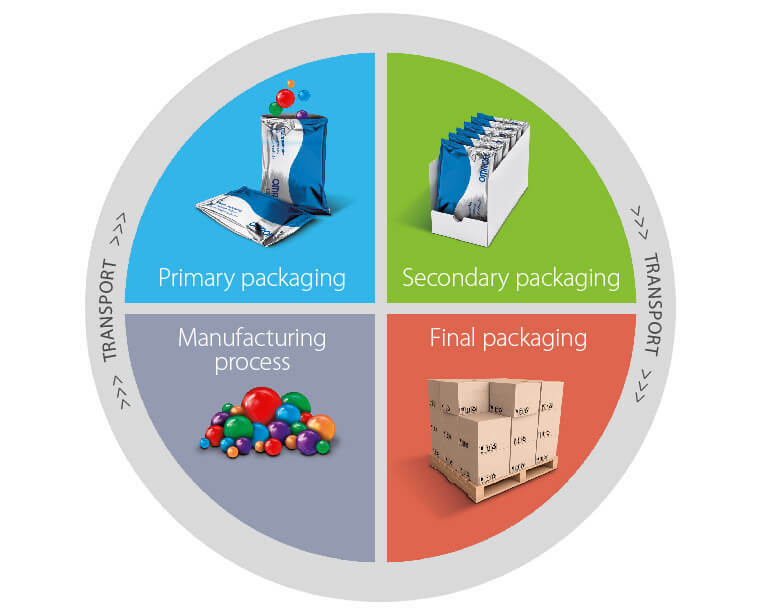 Our PackML-compliant solutions are achieved via three elements. These HMI templates are included in Sysmac Studio, and they ensure the same look & feel as all other PackML-compliant devices. For example, the navigation tools are always located in the top bar, green always means start, and red always means stop. You can easily design the 17 machine states as well as transition, action and defined State paths with our PackML State Machine Function Block. This controls the modes and the states of a device and outputs the current mode and state in compliance with PackML. PackTags are communication packets that describe the condition of a machine in a very specific format. Since they are standardised, they not only simplify machine-to-machine integration but also communication from the shop floor to the top floor and integration with the MES. In Sysmac Studio you can easily design the machine states as well as transition, action and defined State paths with our PackML State Machine Function Block. This controls the modes and the states of a device and outputs the current mode and state in compliance with PackML. Read more about Sysmac Automation Platform and Sysmac Studio. 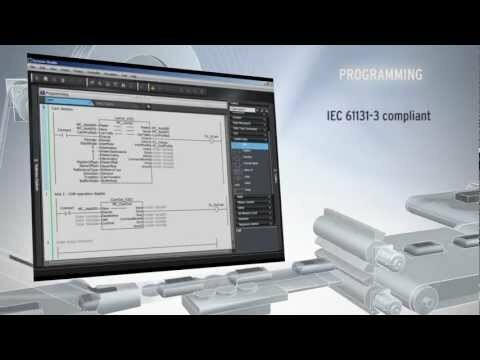 Sysmac is a powerful and robust automation platform with a new machine automation controller (NJ), that integrates motion, sequencing, networking and vision inspection, a new software (Sysmac Studio), that includes configuration, programming, simulation and monitoring and a fast machine network (EtherCAT) to control motion, vision, sensors and actuators.